Larger yellow ant workers are about a quarter inch in length and very yellow in color. When disturbed, larger yellow ants release a compound smells to humans very much like citronella or lemon. Larger yellow ants eat the honeydew of aphids and mealybugs feeding on the roots of plants. Honeydew is essentially the excrement of these pests that contains plant sugars and other nutrients. Since larger yellow ants feed primarily below ground and there colonies are below ground, we seldom see them outside in our gardens. However, larger yellow ants are encountered by many people in the late summer and fall when winged swarmers are produced. Often the swarmers will stay with the colony through the winter and together the colony will move toward buildings and try to enter through cracks or gaps in the foundation. If the colony gains entry they will set up a temporary nest. The temporary indoor, winter nest is usually somewhere in the basement under a loose brick or board or in a crack in the wall or floor. During the winter larger yellow ants do not forage for food through the house and apparently cause very little damage except to create piles of dirt at the entrance to the nest. 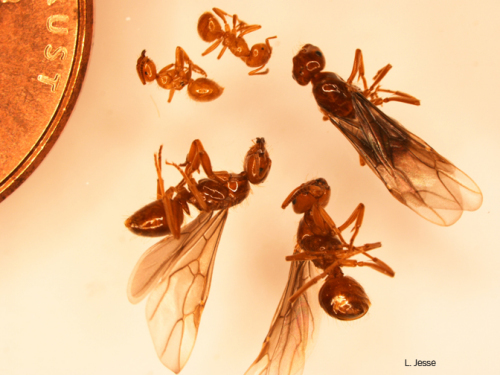 Reportedly, these ants try to return to the outdoors sometime in the early spring if left undisturbed. Control of larger yellow ants is not critical, since they cause little damage other than the annoyance of their presence. Ants found indoors in the winter can be vacuumed or swept up and discarded. Concerned homeowners often fear that groups of larger yellow ant swarmers are termites. Termites also produce winged swarmers in a manner similar to ants. However, winged termites and winged ants can be differentiated. Ants and termites are actually not very closely related at all in the insect world. Termites are in a completely separate group and ants are more closely related to wasps and bees. Several characteristics are used to distinguish termites from winged ants. Ants have antennae with a bend, or elbow, and termites have straight antennae. Both ants and termites have 4 wings, but ants have different sized wings (the hindwings are smaller than the forewings) and termites have 4 wings that are the same size. Links to this article are strongly encouraged, and this article may be republished without further permission if published as written and if credit is given to the author, Horticulture and Home Pest News, and Iowa State University Extension and Outreach. If this article is to be used in any other manner, permission from the author is required. This article was originally published on February 20, 2008. The information contained within may not be the most current and accurate depending on when it is accessed.